When residents in the Quebec town of Lac-Mégantic describe the scene after an oil-train derailed and then exploded there last July, they say the burning petroleum was like a wall of fire, or a river of fire. The blaze, which burned for 36 hours, sent flames and smoke hundreds of feet into the air. At one point, the fire was pulling in so much oxygen that nearby trees were whipping about as if in a tropical storm. Several blocks from the blast site leaves turned an orange-red color from the overwhelming heat. It was early summer, but they looked like autumn foliage. The explosions and fire destroyed some 40 buildings and killed 47 people, most of whom were enjoying live music at a popular cafe. Wooden homes along the lakeshore burned from the inside out as fire erupted out of water pipes, drains, and sewers. A 48-inch storm pipe that runs from the train yard to the nearby Chaudière River became a conduit for the petroleum, spewing flames and oil more than half a mile into the water. “It looked like a Saturn V rocket,” says Robert Mercier, director of environmental services in Lac-Mégantic. Manhole covers on the Boulevard des Veterans exploded as columns of fire shot into the air. On Friday, July 5, a 79-car train carrying petroleum from North Dakota’s Bakken oil fields had been parked for the night on a modest but steady incline in the town of Nantes, seven miles outside of Lac-Mégantic. The sole engineer employed to secure the train and responsible for applying handbrakes in some of the cars left his shift at 11:25 p.m. At 11:30 p.m. a 911 call was made reporting a fire on one of the locomotives. Twelve firefighters from the town of Nantes arrived, along with two track-maintenance employees from Montreal, Maine & Atlantic, the company operating the train. They extinguished the fire and left the scene. Just before 1:00 a.m. the train began to roll down the incline. It eventually reached a speed of more than 60 miles per hour before it careened off the track toward the Musi Café nightclub and exploded. Campagna and his wife, Claudette Lapointe, grabbed their pillboxes and cell phones and fled. The hood of their car was so hot that he couldn’t touch it. (According to Mercier, the heat could be felt for more than a mile.) From a safe distance, about a quarter-mile away, they watched as the town burned. In the early morning hours a steady rain began to fall. The surface of Campagna’s umbrella was so warm that when the drops of water bounced off it they sent spirals of steam into the night. If not for the rain, Campagna says, the whole town would have been destroyed. “The rain saved us,” he says. Lac-Mégantic residents had little warning they were in danger. Few residents interviewed for this article knew that millions of gallons of highly flammable light crude oil were passing through their lakeside village nearly every day. When it comes to transporting oil by rail, the railroad industry and oil and gas companies operate in near total secrecy, with little federal oversight or regulation to ensure public safety. The criminal investigation into the accident in Lac-Mégantic, which has focused on the question of whether the brakes were properly secured, was completed in late March. Charges had not been issued, though they were anticipated, when this story went to press. Even as federal regulators discuss new safety measures – updating or retrofitting the standard petroleum tank cars, reducing train speeds near towns, and performing spot inspections of oil trains – oil trains continue to roll through towns and cities across the United States and Canada. In the last six years the quantity of oil being shipped by rail across North America has increased dramatically. Most of that increase comes from the recently tapped shale oil fields in North Dakota. The Bakken formation is now producing more than one million barrels of crude oil a day, and more than 60 percent of that is shipped by rail. According to the American Association of Railroads, there were 9,500 rail cars carrying crude oil in 2008. Last year there were more than 400,000. “The Bakken shale has gone from close to nothing to a million barrels a day in a very short time,” Energy Secretary Ernest Moniz told an Albany newspaper in February. “And the infrastructure certainly just isn’t there, certainly in terms of pipelines to manage that.” That means more and more shale oil will be shipped by rail in outdated cars, on tracks that are rarely inspected, and through towns and cities ill equipped to deal with a disaster. Since the Lac-Mégantic disaster there has been a string of oil train collisions and derailments. Late on the night of November 7, a train carrying at least 2.7 million gallons of Bakken crude derailed near Aliceville, Alabama, resulting in dramatic explosions similar to those seen in Lac-Mégantic. Because the train exploded a few miles outside of Aliceville, no one was injured or killed. On December 30, a train carrying crude collided with another train outside of Casselton, North Dakota, releasing more than 400,000 gallons of oil into the surrounding land. At least half the town’s 2,400 residents were evacuated, though no one was injured. 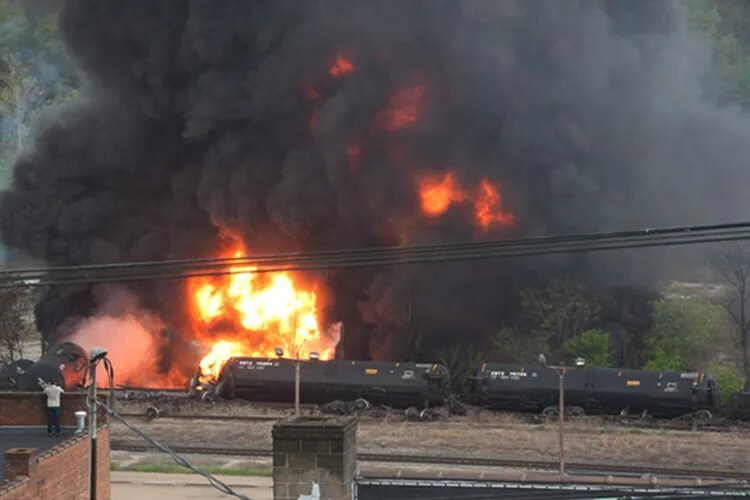 And on April 30, an oil train operated by CSX derailed in the city of Lynchburg, Virginia, sending flames and oil into the James River and forcing the evacuation of more than 300 residents. Last year more oil spilled in rail accidents – 1.15 million gallons – than the previous 35 years combined. The economic and political pressure to move the oil far exceeds efforts to upgrade the nation’s rail infrastructure and impose new regulations on either the oil or rail industry. Kenton Onstad, a North Dakota legislator who lives just outside New Town, where the train that exploded in Lac-Mégantic originated, says the nation’s oil-by-rail infrastructure needs to be overhauled and that it should have started years ago. According to Onstad, public officials have known since 2009 that the amount of production from the Bakken would be close to what it is today, and yet they did little to prepare for the oil boom. “I think it was economics and profits versus safety,” he says. “We’ve got all kinds of failings on all sides, inadequacies that are coming to light because trains are blowing up all over the place,” says Fred Millar, a railway safety consultant. The worries about basic railroad safety are compounded by concerns over the unique composition of Bakken shale oil. Independent tests obtained by Earth Island Journal suggest that the North Dakota light crude is especially flammable, perhaps because it is being produced at such a breakneck pace that drilling companies aren’t following standard industry practices to separate out volatile gases. Each day millions of gallons of highly combustible oil are moving through major metropolitan areas – yet local residents and public officials are often unaware of the danger, and many first responders are unprepared for a disaster like the one that occurred in Quebec. Smith and a pair of colleagues drove up to Lac-Mégantic, where they took samples of the oil from the Chaudiere River. The samples were then tested at an independent lab in Ohio, and later shared with a small group of scientists, including a visiting researcher at Woods Hole Oceanographic Institution. The results showed very high levels of volatile organic compounds (VOCs) present in the oil. Unsatisfied with the lack of information on the characteristics of Bakken crude – and unable to get answers – Smith took a trip to North Dakota and obtained samples of oil from a landowner with an oil well on his property. As he pumped oil out of the ground, Smith says, he could hear the gases escaping. Smith returned to North Dakota after the train collision outside of Casselton and spent 36 hours documenting the spill and taking samples. Smith now has conducted detailed analyses of Bakken crude from the three accident sites in Quebec, North Dakota, and Alabama, along with baseline data. He says he is the only outside expert to have done so and has shared those lab results with Earth Island Journal . Even government agencies – including the US Department of Transportation (DOT), which is tasked with regulating oil by rail transport – have been largely kept in the dark about the qualities that make Bakken crude so volatile as well as how it varies throughout the formation. “Despite the energy industry making assurances to DOT more than two months ago, we still lack data we requested and that energy stakeholders agreed to produce,” a Department of Transportation spokesperson told Reuters in March. All the samples collected and tested by Smith share the same high levels of VOCs and alkane gases in what Smith says are exceptional combinations. According to Smith, 30 to 40 percent of Bakken crude is made up of toxic and explosive gases. Typically these gases are separated out of the crude oil before transport. A recent report by the Pulitzer Prize-winning website Inside Climate News speculates that because of the whirlwind pace of production in North Dakota and the absence of processing facilities, volatile gases like propane are not being removed at the wellhead. There’s still a lot we don’t know about Bakken crude, Smith says. This includes the presence of metals, radioactive materials, and gases. Because of the varying depths of the Bakken formation, two wells a mile apart can produce crude oil with very different characteristics. This makes sampling and testing especially tricky. It also makes industry cooperation essential. Independent reviews corroborate Smith’s findings. Chemists with California’s Office of Spill Prevention and Response examined Smith’s samples and concluded that the Bakken crude “resembles a typical crude oil that has been mixed with diesel or a diesel/gasoline mix. … Obviously, flammability and volatility are greater concerns with Bakken than with ‘typical’ heavier crudes.” In February The Wall Street Journal , based on its own analysis of data collected by the Capline Pipeline in Louisiana, reported that oil coming from the Bakken has significantly more combustible gases and a higher vapor pressure than oil from other formations. 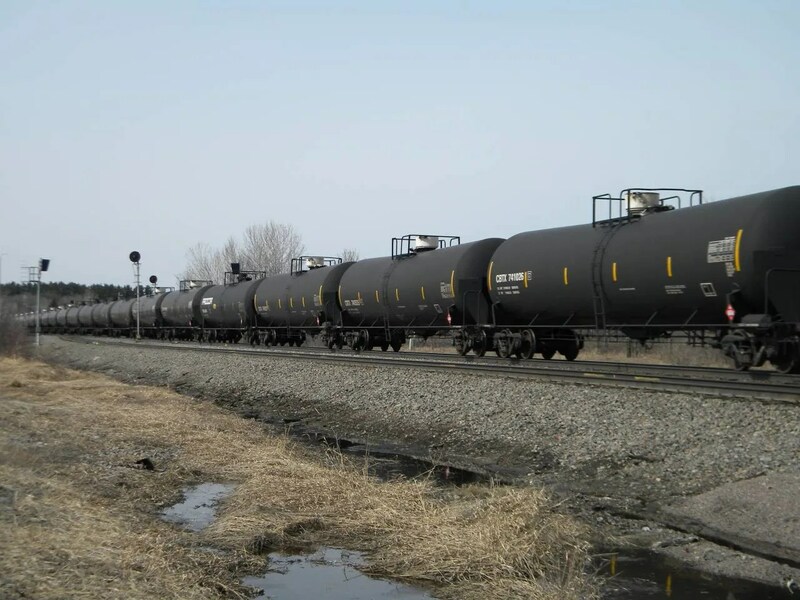 In early March, Canada’s Transportation Safety Board (TSB) issued its own findings from oil samples taken from the nine tank cars that did not derail in Lac-Mégantic. While the TSB does not contend, as Smith does, that the Bakken oil is significantly different from other light sweet crudes, the agency also found that oil coming out of the Bakken has a very low flashpoint – which means that it ignites easily or at a relatively low temperature – a level more similar to unleaded gasoline. When the rail cars went off the track in Lac-Mégantic, sending up sparks and static charges, it didn’t take much to set off explosions. “All of the conditions required for ignition to occur were present,” the TSB report concluded. Even the US government appears to be scrambling to understand precisely what makes the Bakken crude so dangerous. According to The Wall Street Journal , federal regulators seeking information about the flammability of Bakken crude have been rebuffed by the oil industry. When asked to respond to findings that Bakken crude may be especially volatile, a North Dakota Department of Mineral Resources spokeswoman, Alison Ritter, wrote in an email: “We do not have the expertise to analyze Bakken crude. Crude samples are submitted to us for possible third party analysis. It would be up to that independent analysis to make the determination as to the volatility.” Only in late March did the North Dakota Petroleum Council, an industry trade group, announce that it would be doing its own analysis of Bakken crude across 12 sites and six rail depots. A map of the nation’s freight rail network looks like a diagram of the circulatory system, its 140,000 rail miles the blood vessels and capillaries connecting major cities to ports and refineries. At its heart is Chicago, which has more lines of track extending out than any other city. More than 500 freight trains and 800 passenger trains pass through the city every day. From there everything flows. Through Kansas and Oklahoma City to the Gulf Coast, where Kinder Morgan has plans to complete a 210,000-barrel-per-day rail terminal in Houston. Through Cleveland and Buffalo to ports on the Hudson and refineries in Philadelphia, New Jersey, and Delaware. North through Montreal to the Irving Oil Refinery in New Brunswick, where the train that leveled Lac-Mégantic was destined. Every day oil trains carrying up to 85,000 barrels of oil arrive in Albany, a city of about 100,000 people. A refinery in Philadelphia receives one-fifth of all oil produced in the Bakken and has plans to expand production and rail capacity. In January, an oil train derailed while crossing a bridge over the Schuylkill River, though no oil spilled. Other trains carrying Bakken crude move west from North Dakota to Washington, Oregon, and California. For the oil industry the location of the Bakken is a blessing and a curse. It’s close to the Chicago hub, but about as far from ports and refineries as possible. This means the oil has to travel long distances, in some cases thousands of miles, and is subject to fluctuations in temperature and pressure, a factor that Smith says can contribute to its volatility. As temperatures rise, the oil warms and expands. As the rail cars move and shake, volatile compounds like propane and butane can separate from the oil and rise to the surface, collecting in the headspace above the liquid petroleum. A small puncture, leak, or derailment accompanied by a static charge or spark can set off an explosion. They do so without the public and, in many cases, emergency response teams knowing. Railroads are not required to publicly disclose when and where they ship their freight. (In the wake of recent accidents, some railways have provided limited information to emergency response teams and local officials). They also have vigorously resisted efforts to force them to reroute hazardous material around densely populated areas. In 2005, Washington, DC passed an ordinance forcing CSX to reroute hazardous materials around the downtown. But the rail industry sued, then lobbied for passage of a federal bill that would preempt local control, essentially nullifying the DC ordinance. In 2007, Congress passed and President Bush signed an industry-friendly bill that allows the railroads to make routing decisions without public disclosure. Lack of information regarding the oil itself and its whereabouts can be multiplied across hundreds of towns and cities in North America. Randy Sawyer, the chief environmental health and hazardous materials officer for Contra Costa County in California, says the rail companies haven’t shared any information with his agency about when and where the oil will be moving. In the coming year, California expects to receive at least six oil trains per day, each carrying approximately 2.7 million gallons of crude oil, an increasing amount of it from the Bakken. Much of that could pass through Contra Costa County, which is home to four refineries and more than one million residents. However, interviews with local emergency response officials in Virginia, where a CSX train derailed in late April, suggest that the company’s outreach efforts vary widely. According to Ryan Muterspaugh, director of public safety in Alleghany County, the railways do not supply information on volume, content, or frequency of rail cars with any regularity. “The railways are not as forthcoming with their transportation information as we (or anyone) would probably like them to be,” he wrote in an email. “Our emergency management personnel or fire/rescue agencies have not had any interaction with the railroad specifically regarding the transportation of crude oil.” Gary Roakes, the fire marshal of Amherst County, which borders the city of Lynchburg, wrote: “We have not had any contact with CSX or any other carrier about what is being shipped through this area.” Kohut says he has never heard of SecureNOW. As this story went to press, the investigation into the Aliceville, Alabama explosion in November 2013 was still ongoing. An accident report submitted to the FRA by rail line company Genesee & Wyoming at the end of December stated: “Cause of derailment has not been determined.” The investigation could take several more months. According to Genesee & Wyoming, the rails had been inspected just four days before the accident and, over the past year, had received a “disproportionately high” level of investment. “There was no concern about the state of the track,” the company’s CEO told Reuters. The company also noted that the train was going slower than the 40 mph speed limit. In addition, it’s a straight section of track on flat ground. Had the explosion occurred a few miles up the track, it would have ripped through the small town of Aliceville, which has a population of about 2,500. The same goes for the Casselton collision, which occurred a mile from the center of town. Local officials, fire departments, and emergency responders had very little to go on. “We had no idea it was this volatile,” Casselton fire chief Tim McLean told a local paper. Meanwhile, information about Bakken crude, the trains carrying it, and its impact on the environment in the event of a spill will continue to come from citizen watchdogs. Five days after the Alabama explosion, Scott Smith tried to access the crash site along with John Wathen, a member of the Waterkeeper Alliance and a Hurricane River Creekkeeper for Friends of Hurricane Creek, an Alabama conservation group. A private security guard working for Genesee & Wyoming told them that the location was off limits and that the FBI and FRA were conducting an investigation. They were also told by the guard that the “mess” had been contained. The following day Wathen and South Wings, a conservation group that uses small aircraft to evaluate the environmental impacts of oil spills and other disasters, flew over the area. They were immediately able to identify the location of the spill and could see rainbow colored slicks a quarter-mile from the crash site leading into Lubbub Creek, which eventually flows into the Tombigbee River. The wetland surrounding the railroad track was filled with oil. Wathen says he spotted emergency workers standing waist deep in crude spraying with high-pressure hoses to disperse the oil. After the flyover, Wathen returned several times to monitor the cleanup. Eleven weeks later he was still able to place a quart container next to the tracks and fill it with Bakken crude. There were few signs of life, Wathen says. Most of the trees and plants –cypress, tupelo, and black gum – had been burned, and the water was still laced with oil. Adam Federman, a Middlebury Fellow in Environmental Journalism, has written for The Nation, Columbia Journalism Review, Gastronomica, Adirondack Life, and other publications. In case the near continuous reports of fiery, deadly oil train accidents hasn’t been enough to convince you, Earth Island Journal is out with a startling investigative piece on North Dakota’s oil boom and the dire need for regulations governing that oil’s transport by rail. The article is pegged to the train that derailed and exploded last summer in Quebec, killing 47 people, although it just as well could have been the story of the train that derailed and exploded in Alabama last November, the train that derailed and exploded in North Dakota last December, the train that derailed and exploded in Virginia last week or — let’s face it — any future accidents that many see as an inevitability. The Bakken oil fields in North Dakota are producing over a million barrels of crude oil a day, more than 60 percent of which is shipped by rail. All that greenhouse gas-emitting fossil fuel is bad enough; that more oil spilled in rail accidents last year than the past 35 years combined is also no small thing. But the particular chemical composition of Bakken oil lends an extra weight to these concerns: according to the Pipeline and Hazardous Materials Safety Administration, it may be more flammable and explosive than traditional crude. All the samples collected and tested by Smith share the same high levels of VOCs [volatile organic compounds] and alkane gases in what Smith says are exceptional combinations. According to Smith, 30 to 40 percent of Bakken crude is made up of toxic and explosive gases. Typically these gases are separated out of the crude oil before transport. A recent report by the Pulitzer Prize-winning website Inside Climate News speculates that because of the whirlwind pace of production in North Dakota and the absence of processing facilities, volatile gases like propane are not being removed at the wellhead. Independent reviews corroborate Smith’s findings. Chemists with California’s Office of Spill Prevention and Response examined Smith’s samples and concluded that the Bakken crude “resembles a typical crude oil that has been mixed with diesel or a diesel/gasoline mix. … Obviously, flammability and volatility are greater concerns with Bakken than with ‘typical’ heavier crudes.” In February The Wall Street Journal, based on its own analysis of data collected by the Capline Pipeline in Louisiana, reported that oil coming from the Bakken has significantly more combustible gases and a higher vapor pressure than oil from other formations. In early March, Canada’s Transportation Safety Board (TSB) issued its own findings from oil samples taken from the nine tank cars that did not derail in Lac-Mégantic. While the TSB does not contend, as Smith does, that the Bakken oil is significantly different from other light sweet crudes, the agency also found that oil coming out of the Bakken has a very low flashpoint – which means that it ignites easily or at a relatively low temperature – a level more similar to unleaded gasoline. When the rail cars went off the track in Lac-Mégantic, sending up sparks and static charges, it didn’t take much to set off explosions. “All of the conditions required for ignition to occur were present,” the TSB report concluded. Lindsay Abrams is an assistant editor at Salon, focusing on all things sustainable.